Thank you to all who attended the 4th Annual Puget Sound Green Infrastructure Summit on March 22nd, 2019. Check back soon to view powerpoint presentations from the day of. On March 22nd, 2019, Stewardship Partners and the summit Host Committee convened the 4th Annual Puget Sound Green Infrastructure Summit, a City Habitats event. The vision of this summit is to convene diverse leaders from Puget Sound cities and towns to map the strategic role of green infrastructure in our shared clean water future. 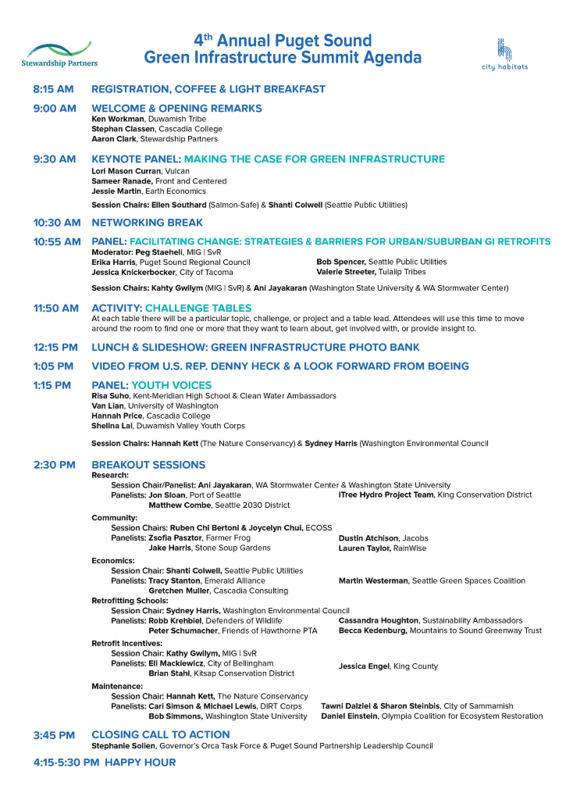 This year’s Summit put a special focus on retrofitting our existing built environment in addition to making the economic, social, and ecological case(s) for green infrastructure. Local, regional and state agencies, businesses, non-profits, community groups, educators and students spent the day building their collaborative networks and learning from thought leader peers.